Luigi Riva is a legendary figure in the history of Italian calcio. He was born in 1944 in the small Northern Italian town of Leggiuno. In 1963, he was purchased by a Serie B team, Cagliari, from the island of Sardinia. The following year they were promoted to the Serie A, and Riva would remain with them for the rest of his illustrious career. 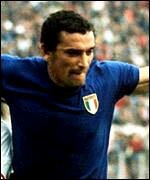 He made his debut for the Azzurrri in 1965. He was taken to the 1966 World Cup to obtain a taste of the competition; however, he was not selected to play in any games. In 1968, he competed in the European Nations Cup competition, which was hosted and won by Italy. In 1970, Riva made his mark on World Cup history. In one of the classic games of the World Cup in Mexico, Riva scored a goal in the semi-final extra time 4 to 3 victory over West Germany. Unfortunately, Italy faced one of the best teams ever fielded, the Brazil of Pelé in the final. Italy lost, 4 to 1, and Brazil became the first three-time winner of the World Cup. After his career ended, Riva became a part of the management at Cagliari. Presently, Gigi is the team manager for the Italian National Team. In this position, he acts as a mediator between the head coach, the players, and the media. He is well-respected by the players, and is seen as a father-figure to many. In the World Cup final of 1994 at the Rose Bowl in Pasadena, he was the first person to console a disconsolate Roberto Baggio after he missed the penalty kick that granted Brazil the championship. Perhaps few could truly appreciate Baggio’s pain than Riva, who twelve years before was also defeated by Brazil. From his many achievements, one stands out above the rest. In 2004, Gigi’s famous #11 shirt was retired during a World Cup qualifying game in Cagliari. No other Italian has ever received this tremendous honor. Luigi “Gigi” Riva. Rolling thunder. Azzurri legend. Native son of Leggiuno. Adopted son of the island of Sardinia. In 2004, he became the only player in Italian soccer history to have his number retired by the National Team. One Italian Serie A Scudetto (Championship) in 1969/70. Data courtesy of Forza Azzurri Statistics by Pierre Bonello.